In the last part of this series I would like to talk about home safety for the elderly in regards to hazardous substances. In case you missed parts 1 and 2, we went over some tips regarding fall prevention and home emergency preparedness, respectively. The couple in this house was thrown from their second-story bedroom into the backyard and miraculously survived. Their 18-year old son, however, was killed as he was sleeping in the basement floor. 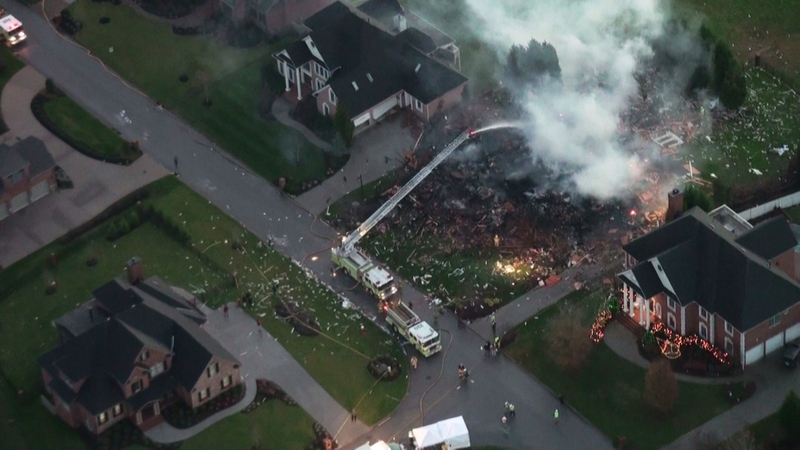 While I am very saddened for this family, I hope this tragic accident will be a reminder for the rest of us to pay very close attention to the hazardous substances in and around our home and also in and around the homes of the ones we love. Here are a few hazards to be aware of. 1) Natural Gas – This common fuel is used by millions of people across the United States every day to heat their home, heat their water heater, or cook their food. While natural gas is harmless when used correctly, it can be deadly whenever a leak occurs, as seen above. Even though an odorant (smells like rotting cabbage) is added to natural gas to help users detect leaks, it is important to obtain a natural gas detector from your local hardware store. This is especially important for the elderly person who might be suffering from deterioration in smell sensitivity. If your detector or sense of smell alerts you that there is a natural gas leak in your home, calmly exit your home without touching any electrical outlets, light switches, or any other device that may cause a spark. Call 911 only after you have safely left your home. Do not use your cellphone inside your home. Alert your neighbors of the situation. 2) Radon- According to the Environmental Protection Agency, Radon is a cancer-causing radioactive gas that builds up in the air you breathe in your home. Radon comes from the breakdown of uranium in the soil, rocks, and water around your home and can enter your home through wall cracks or through the water supply. The main risk surrounding radon is the development of lung cancer. In fact, radon is the 2nd leading cause of lung cancer in the United States; smoking is number one. The potential risk involved with radon is even higher for seniors who spend most of their time each day inside their home. However, there are several ways to reduce radon levels inside your home. For more information, visit the EPA’s website on radon testing and reduction. 3) Carbon Monoxide (CO) – Because CO is an odorless, colorless, and toxic gas, it can kill you before you know it is in your home. There are several sources in the home that can produce CO.
Low concentrations of CO in the home can result in flu-like symptoms in an individual. However, as I stated earlier, high concentrations of CO can be fatal. Because of this risk, CO measuring devices should be used in the home, especially in an elderly person’s home. For more information, visit the Environmental Protection Agency’s website on Carbon Monoxide in the home. I hope this series has been helpful in outlining some the of risks involved in an elderly person’s home. At Preferred Care at Home, we celebrate life, dignity, and independence. I hope you have received some valuable tools to help make a difference this new year in the life of someone you love.